We got to Mom and Dad’s around 3:30 yesterday and played and swam (when it was raining 😏). The day and evening went as usual. The kids ate while playing video games and stayed up late just goofing off. Fast forward to midnight when Judah comes into our room complaining of a headache. We got him in our bed, took his temp (normal), and propped him up hoping this was the worst of it. At 4:30AM, I felt his belly and it was super hot. 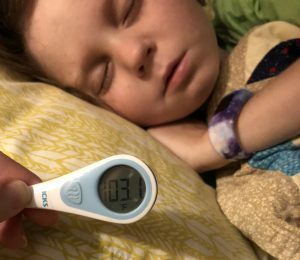 So we took his temperature – 102.8. We decided to wait 30 mins. If it went up, we’d call the on-call Dr. If it went down, we’d wait it out. 5:00AM rolled around d and his temp was up to 103.4. So I called the on-call Dr. He was so lovely. He didn’t know Judah or his history but he listened and was reasonable. I told him that they have always gone down by the time we get to the ER and that we are actually farther than normal for the holiday. Sonhe said, ok his counts are good, yes? I’m going to let you watch him. If it goes up, call me back and he has to go to the ER. If it goes down, you can stay home. I will let Dr Spiller know tomorrow.” And by 6:30AM it was normal. We are tired again. And hoping this is not a foreshadowing of what this week will look like. Because this is how it startedast time we had 3 fevers in 4 days. Prayers we get to enjoy our time here at Mumzy and Papa’s and Judah doesn’t get anymore fevers until chemo Thursday. Nothing pretty to see here. Since the last post, Judah has been to the ER 2x’s and had fevers 4x’s. 2x’s we chose not to take him. This morning, at 5am, when Judah came in with a headache and fever, Matthew and I discussed going or not going. We said, this is nothing new. And the ER would do nothing new. But we want an MRI or CT of his head while he has a fever. So we decided to go. I called the on-call oncologist and went through the same story I always tell. Because it’s always the same. I listened to his story (we just need to check his counts and make sure he’s safe) and tried not to interrupt him because I know this speech. It’s also always the same. When he told me we needed to take Judah to the ER, I asked him if he would order a CT or an MRI. Dr: On Saturday. No probably not. If he is admitted, maybe. Me: I know it’s super inconvenient that Judah always gets sick on the weekends and holidays. But he’s had these fevers and headaches for 2yrs and no one has done anything but blood work. If that’s all they are going to do, why should we go? Dr: (say it with me) We need to make sure Judah is safe. So Matthew is at the ER with Judah as I write this. And they are doing blood work. I cannot speak for Matthew. I can say, for myself, I’m losing my faith. I feel it slipping. My hope trading for cynicism. I don’t believe in Judah’s Drs but I have said before that God can work through anyone. But He’s not. 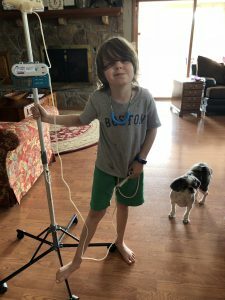 Judah is sick and he keeps getting sick and NO ONE WILL HELP HIM! 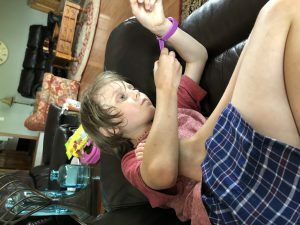 Unless there is a Dr, like Phil Noe, the guy who found Judah’s tumor almost 6 yrs ago, that WANTS to figure this out, do different testing, while he’s running the fever, they won’t figure it out. They will keep pretending like they are keeping him safe when really they are playing it safe. Everyone thinks it’s the tumor. And they won’t look anywhere else. And maybe it is the tumor. Maybe it isn’t. But we won’t know if they won’t look at his head while he’s running a fever! We are sad. We are angry. We are utterly exhausted. It sure would be nice if the Creator of the world, would give us just a little leg up. Until then, we are trying to figure out where to take Judah next. To find someone interested in the Judah puzzle. Posted in chemo problems, crush cancer round twoTagged braincancer, brainstemtumor, cancerproblems, chemoproblems, crushcancerroundtwo, ervisit, ihatethattumor, jpa, judahfinn, judahfthacker, pediactricbraincancer, pediatricbraincancerawareness, stupidbraincancer, stupidcancer, teamjudah, waiting, warriorLeave a Comment on Nothing pretty to see here.